Neutron diffraction data of barium iron arsenide with sodium ions substituted onto 24 percent of the barium sites (doping) showed evidence for a new magnetic phase in iron-based superconductors. The atomic and magnetic structures of the material are temperature-dependent. Upon cooling, the structures exhibit three distinct structural states: high temperature disordered – top right; magnetic nematic phase – middle right; magnetic four-fold phase – bottom right. In the schematic illustration (right side), the blue spheres represent iron atoms and the red arrows show the direction of their magnetic moments. 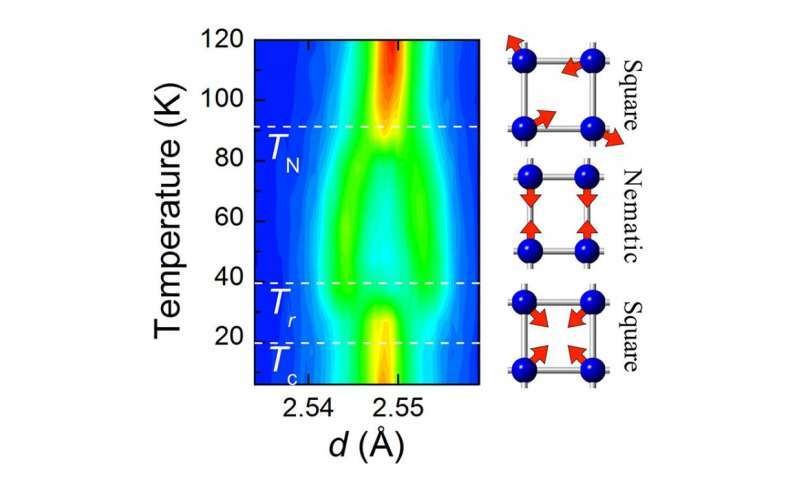 The emergence of a new magnetic phase with a square lattice prior to the onset of superconductivity is revealed in some iron arsenide compounds, confirming theoretical predictions of the effects of doping on magnetic interactions between the iron atoms and their relationship to high temperature superconductivity. Understanding the origin of different thermodynamic phases is important for the development of a unified theory for the elusive microscopic mechanism underlying high-temperature superconductivity; these observations provide key information useful for its development. The discovery of unconventional superconductivity in iron-based materials in 2008 provided yet another platform for understanding the mechanisms that govern the high-temperature superconductivity first observed in copper oxides in 1986. In general, superconductivity can be induced in iron arsenides by replacing a fraction of certain elements with a different kind (chemical doping) to alter the number of mobile electrons in the materials. At room temperature, the iron atoms sit on a square lattice (see figure, top right) with their magnetic moments oriented in a random fashion. Upon cooling, the material undergoes a structural transition forming a rectangular lattice. This transition, which is referred to as "nematic order," is accompanied by magnetic order (middle right). What drives nematic order is controversial, but understanding its origin is important to learn about the mechanisms for unconventional superconductivity, both for the iron-based compounds and the copper oxides. Until now, it was thought that nematic order persists as the material cools all the way to its superconducting state. However, the emergence of a new magnetic phase discovered in this neutron powder diffraction study shows that some materials return to a square lattice with ordered magnetic moments prior to the onset of superconductivity (bottom right). This is consistent with theoretical predictions that magnetic interactions drive the restoration of four-fold symmetry when they are weakened by chemical doping, close to the onset of superconductivity. There is a small doping range where magnetism and superconductivity coexist; this is where the new magnetic phase is seen by neutron diffraction. The observations thus provide strong evidence that magnetism drives both the nematic order and its eventual destruction prior to the emergence of superconductivity. This is one of two Physorg articles today on superconductivity and magnetism--this for iron based material, and the other for a cuprate. Both provide strong support for a theory that I have advanced in many prior physorg posts, which in turn is based on Art Winfree's law of coupled oscillators. Here, the bottom illustration shows a four oscillator system (square) precisely interconnected in a Winfree pattern at two levels: four atoms in Winfree pattern, and four electrons in a Winfree pattern. This Winfree coupled oscillator system is far more precise than the two pictures above it. The cuprate article published today is "Intertwining of superconductivity and magnetism." The "intertwining" (synonym for coupling) is a precise Winfree pattern of coupled waves, which are periodic oscillations. One wave is the superconducting wave function. The other is the envelope function for the atomic magnetism. Ockham's Razor says my theory is correct: One solution.